Fall Into Fresh Flavors at Bonefish Grill - New Menu! Fall Into Fresh Flavors at Bonefish Grill – New Menu! You can still catch great fish in the fall. But instead of having to reel in your line you can just move your fork to your mouth. Bonefish Grill has a tantalizing menu that will satisfy your taste buds this autumn. Last week, I had the luxury of indulging in a few of Bonefish’s new featured entrees. They full of flavor flavors and are creative, to say the least. I kicked off the meal with Bang Bang Shrimp. I don’t know what meal I’ve had at Bonefish that hasn’t started with a Bang-literally. No matter what season it is this zesty appetizer is sure to please. The shrimp was succulent and the batter was a perfect golden brown. The sauce was drizzled evenly across the dish and the lettuce was extra crunchy. It was gone before I could finish deciding what to order off the specials menu. The Cedar Plank Bourbon Salmon called my name from the beginning. It did not disappoint either. The presentation had me sold before I even took a bite. 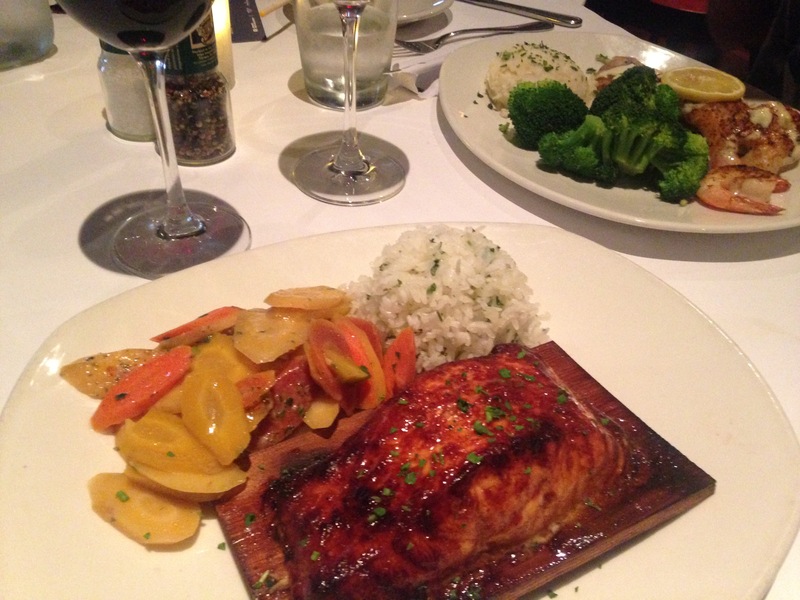 The plump salmon fillet came served on a wooden plank and drizzled in bourbon sauce. My favorite part was that the bourbon was not over-done. It was a sweet, caramel taste that complimented the strong flavor that salmon already delivers but did not over power it. To pair with my salmon I ordered a house red wine, cooked carrots, and rice. Rice can be cooked many different ways but the best is steamed, moist, and not over-done. This met all of the latter requirements. In order to kill two birds with one stone and try even more delightful flavors, I also tried the Rock Fish and Shrimp. Talk about a crowd pleaser. The shrimp on this dish were juicy and HUGE. The shrimp was not over seasoned but rather just lightly flavored to allow it to speak for itself. The Rock Fish, however was sauced with a citrus creamy topping that gave a zing that was extra refreshing to already very fresh fish. To pair with this I had garlic mashed potatoes and steamed broccoli. I was pleasantly surprised that at the fluffiness and flavor of the mashed potatoes and there was a smoky seasoning on the broccoli that made eating it extra enjoyable. One thing I will say about Bonefish that makes them unlike other fine restaurants is that their portion sizes are extra generous. This is uncommon, especially for seafood restaurants. So, when it came to try the dessert, my stomach was moaning. However, with strawberry shortcake on the menu, I couldn’t say no. When my dessert came it was decadently arranged with a biscuit tier formation mixed in with sliced strawberries, whipped cream, and a light glaze. This dish was not overly sweet but it was hearty and ever-so-satisfying. I can’t wait to make another trip to try it all again! This post was sponsored by Bonefish Grill.